Do prog rock live albums work and if so, what is the best prog rock live album ever? Is There A Really Great Prog Rock Live Album? 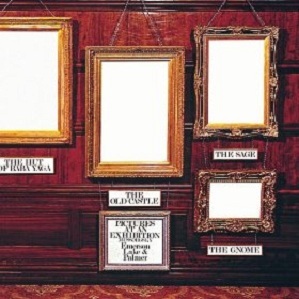 For a genre or music built on studio perfection and concept albums, there is a debate on whether there has ever been a truly great prog rock live album to rival class leaders from other fields like The Who Live In Leeds or Sam Cooke Live At The Harlem Square Club. Seeing a great progressive rock band live is one thing. You have the lights and special effects. The sense of occasion and you have to admire the musicianship to produce complex music live, often with note for note perfection. But a live album that sounds the same as the studio version with applause doesn’t really serve a purpose, does it? I don’t think it does but I believe there are great live albums by progressive rock groups. What makes them great is the extra dynamics and energy that a live setting gives to the music and a willingness to go beyond the studio recording into new areas of improvisation. I’d like to know your thoughts so please leave a comment. Further down, I’m going to ask you to vote for your five favourite progressive rock live albums in the main poll and, because prog rock has continued to develop and evolve, I’ve added a second division poll giving you the chance to vote for five other, less well known live albums. 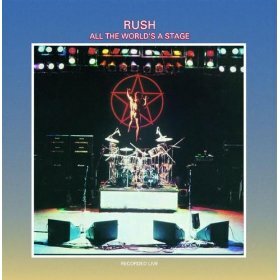 First, I’ve started sharing my own thoughts about what are the best five live albums of the classic progressive rock era of the 1970s. Well that’s when the music was written, if not necessarily when the live albums are recorded. Some people don’t think Pink Floyd are a progressive rock band. While I have some sympathy for that view, I can’t think of a category that they fit into better. Unfortunately I don’t think they have a classic “top of the class” live album. Live tracks from a Wembley 1974 concert have been included in special reissues of Dark Side Of The Moon and Wish You Were Here. Only the encore, Echoes is missing but if Live At Wembley is ever issues as a standalone album, then there is certainly a contender. Two albums stand out for me – the triple album Yessongs by Yes and Seconds Out by Genesis. Both feature fine versions of many of the classic 1970s prog rock songs. The earlier Genesis live album, simply called Live is a fine album but it doesn’t include Supper’s Ready and Genesis playing surprisingly short sets in the Foxtrot and Selling England By The Pound tours. It doesn’t make my top five. Nor do albums by Jethro Tull, Emerson Lake & Palmer, King Crimson, Rush or Hawkwind. I don’t think the songs are strong enough. Hah, I bet that might have upset you. Next in my top 5 prog rock live albums is The Last Great Traffic Jam by Traffic. This is a reunion album from 1994 and is missing original members Dave Mason and Chris Wood. As far as I’m concerned, the performance is very good and the setlist much stronger than the 1973 album On The Road. I know I shouldn’t love it but it remains one of my go to albums when I’m in the mood for prog rock style music. My fourth album is another reunion album, this time by Van Der Graaf Generator from 2005 called Real Time. The only 1970s live album from VDGG was Vital and that was missing many of the songs I considered essential. Real Time puts that right and includes 3/4 of my favourite VDGG studio album, Godbluff. They may not be the easiest of bands to like but when you do, you develop a real passion for their extraordinary music. I’m holding off in making my fifth and final choice because I want to encourage you to investigate European prog rock. 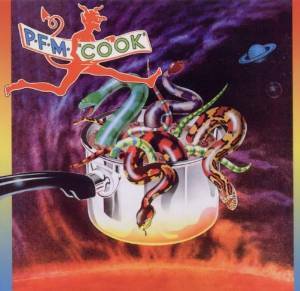 If you were to twist my arm behind my back and force me to make a choice, it would probably be Cook by PFM from Italy. Focus and Tangerine Dream are well known but I’d encourage you to investigate Banco Del Mutuo Soccorso, Eloy, Grobschnitt, Le Orme, and Locanda Della Fate. What Is The Best Progressive Rock Live Album Ever? I’d like you to vote in my poll to find out what is considered to be the best. Is it Yessongs, Welcome Back My Friends, Seconds Out? Or will something more unusual do very well in the poll? I’ve included some Italian and German prog rock live albums. If you haven’t heard these groups, then you’re missing a treat. There are some hidden gems away from the mainstream and the best known bands. You can vote for up to FIVE of your favourites in this list and if you think I’ve missed a great prog rock live album out, tell me who and what particular album by leaving me a comment. The blue links take you to pages with more details about these great prog rock live albums. 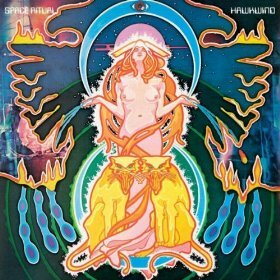 After 240 people voted, I decided that there were less well known bands and albums that should be brought to your attention as a discerning fan of progressive rock. I encourage you to vote for any albums you believe are good enough to be included in the main poll. Promotion and relegation is possible. I also have a separate poll to find the best modern prog live albums where your voting choices are cluttered by loyalties to Genesis, Yes, King Crimson, Pink Floyd etc. It was hard to decide, for example, which two or three King Crimson albums I should include in the main poll. The band polls are very helpful if we want to dig deeper into an artist and their history. Here are the group polls set up or which I intend to create. Something went wrong with my poll for a while which meant that readers could only vote for their favourite prog rock live album. If that happens again, can you please leave me a comment with your extra votes and I’ll fix it. Prog rock is definitely a genre that I’m stuck in the 1970s so I’ll be interested to see if many of the modern progressive rock bands appear on the list to rival the legends. I need your nominations if you think that modern prog stands up well against the glorious music of the seventies. Over 140 prog rock fans have already voted in the poll to find the best progressive rock live albums so I think it’s time to discuss the results so far. After Peter Gabriel left Genesis and before the group released its excellent studio album A Trick Of The Tail, no one would have placed any bets on Genesis to scoop first place in any poll with a live album. 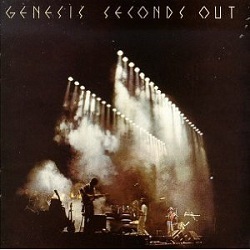 with an excellent selection of songs from the first two post Gabriel albums – A Trick Of The Tail and Wind and Wuthering – Genesis have done it with Seconds Out. Of course it helps that Phil Collins sounds so similar to Peter Gabriel. There isn’t a shock hearing the old songs with the new lead vocalist who sounds very strange. 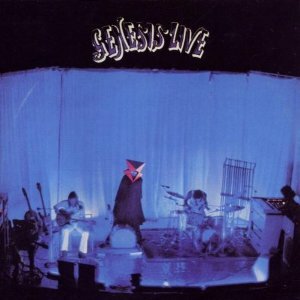 As well as the #1 best prog rock live album, Genesis also provide the album ranked fourth… The 1973 album with Gabriel, simply called Genesis Live. It’s very short for a classic live album but it makes these older songs from Nursery Cryme, Trespass and Foxtrot sound much more muscular. I made a mistake by excluding Three Sides Live from this poll. Losing Gabriel was bad and losing guitarist Steve Hackett made things worse. I took against Genesis and later albums tarnished their prog identity but they were still better than I remembered in 1981. Only four votes separate first and second places in October 2014 but those few votes mean the excellent Yessongs by Yes is in the runner up position. At least it’s got a Roger Dean cover. That really mattered when we all played our albums on vinyl. I suspect that there are plenty of us from the 1970s who first fell in love with the album covers and then the music. 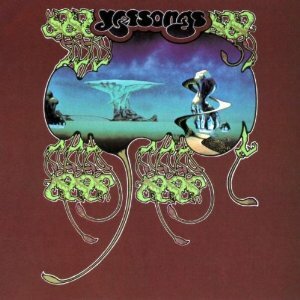 Yessongs is a stunning summary of everything that makes The Yes Album, Fragile and Close To The Edge so good and then it one-ups it all with a more dynamic performance. Their second live album, Yesshows also gained some votes to rank a creditable 13th. I’ve always hoped that this album would be extended because I’d like to hear the other two songs off Relayer performed live. Interestingly, the album that was voted the third best live prog rock album was Pulse by Pink Floyd but that’s not the live recording which is winning the best Pink Floyd live album poll. 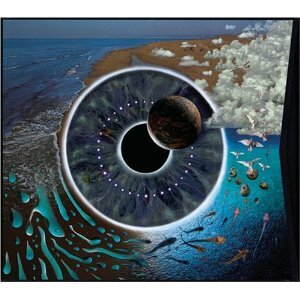 Pink Floyd’s glories are based on five albums – Meddle, Dark Side Of The Moon, Wish You Were Here, Animals and The Wall. I think there’s a debate over whether The Wall qualifies as progressive rock. While it has been recorded live on Is There Anybody Out There, there isn’t a Floyd live album that represents the previous four albums whilst chief songwriter, bassist and singer Roger Waters was a member of the band. Instead, we are left with the Water-less Pulse as the best option available. Or at least we were until the latest issues of Dark Side Of The Moon and Wish You Were Here. As bonuses on the premium priced albums, we were given extracts from the 1974 concert at London’s Wembley Arena. In fact we have everything except for the encore Echoes. This means that anyone with an iPod or mp2 player can create their own Live At Wembley 1974 album. That’s what’s winning the Pink Floyd poll and if we ever get the full concert released, I predict that it could give Seconds Out and Yessongs a serious challenge for the title of the best prog rock live album. 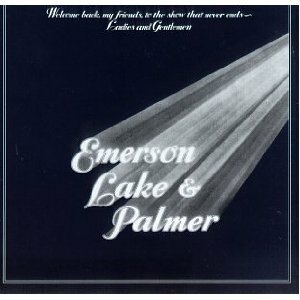 What About Emerson Lake & Palmer? They were certainly not forgotten. Welcome Back My Friends was equal fifth and Pictures At An Exhibition was equal eighth. I give ELP full credit for opening the vaults and releasing plenty of live recordings. In fact it’s hard to keep up. One album that I’d missed but looks exciting is Live at the Mar Y Sol Festival 72. It’s getting praised highly at Amazon but I haven’t reviewed it yet. Is It Prog Or Heavy Metal? They won’t suit prog rock fans who prefer the more symphonic sounds but both are thrilling albums. 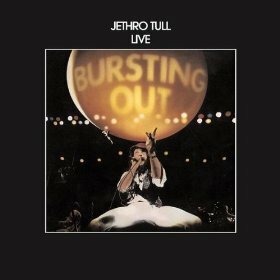 In seventh place is Bursting Out by Jethro Tull. I feel that they missed an opportunity by not releasing their most prog live album. Tull are a bit of a moving target as they moved from blues rock to prog to folk rock to AOR and in-between at various stages. Seventh is very creditable but I always feel that a better album could be released from the archives if we get lucky. And What About King Crimson? If King Crimson didn’t invent progressive rock, they were very close to it with their debut album In The Court Of The Crimson King. The Nightwatch came 10th in the poll and Absent Lovers 12th. I find Crimson a hard group to pin down long enough to develop an affinity. I know some people love them but I’m not so sure myself. Who May Move Up By the Time Of The Next Review? Camel just missed the top 10 with A Live Record but I’d like to see a less well known group emerge. I forgot to include any albums by Van Der Graaf Generator. Whoops! That mistake is now fixed. In fact that brings me on to one thing that disappoints me. While I’m very grateful to everyone who votes in the polls, I’m disappointed with how few recommendations I see for live albums as comments. What about the underdogs? The less well known names that may have served up a great live album? I see each vote as a strong recommendation and I urge you to investigate some of the less known bands. 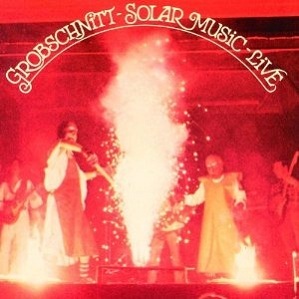 If you love guitar solos and space rock, Solar Music Live by Grobschnitt is well worth investigating. 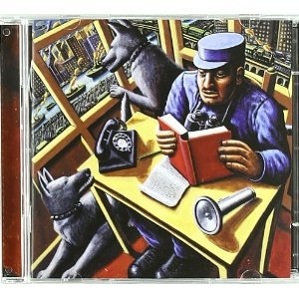 The band also produced a classic symphonic prog studio album called Rockpommel’s Land. 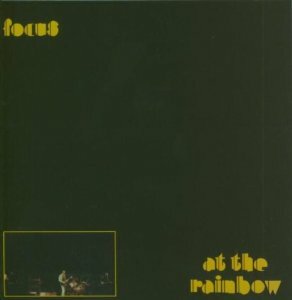 The Netherlands have given us Focus and their Live At The Rainbow album with its combination of pastoral beauty and all-out madness. Sadly it’s got a very disappointing album cover design. 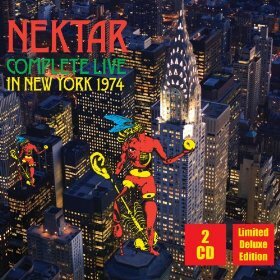 A favourite of mine but it’s not getting any support is Complete Live In New York by Nektar. More symphonic prog with plenty of guitar from an English band based in Germany. Italian prog is also well investigating.but I know some people struggle with song lyrics in a foreign language. I’m planning a specialised poll but I’ll point you to Cook by PFM. Again it’s symphonic prog but I think it stands up very well to comparisons with Genesis and Yes. I think this list of live albums shows how well the polls work when you have plenty of voters. If you don’t agree, you need to vote and leave me a comment, especially if your favourite prog rock album doesn’t even make it into the poll. This entry was posted in Best Live Album Polls, Progressive Rock Live Albums by Paul Simister. Bookmark the permalink. It also includes the later Rush albums but I can understand you deciding that Rush had moved away from their prog rock roots by the time Exit Stage Left was released. I must admit that I’m a traditionalist as far as prog rock goes with my heart firmly based in the 1970s and sometimes the late sixties if I think it’s more prog than psychedlia.